Valve has finally released their last announcement in their Steam Universe campaign: the Steam Controller. The controller itself can be seen above. As we already know, the Steam library is full of Controller enabled games (and if one isn’t controller friendly, you can always use Xpadder), so Valve set out to create a controller that would bridge the desk & living room experiences. Valve says that their controller offers a superior control scheme, with high precision input technology that is focused on low-latency performance. The first thing you’ll notice about this controller, is that it has two rather large track pads on each side. Both are driven by using your thumbs, and they are also clickable. These two track pads offer a much higher level of input & accuracy over the tradition joystick controller. Valve’s aim is to deliver perfected control in games that were difficult to operate on a console; such as RTS, cursor driven, strategy, space exploration, simulation, and a huge number of indie games. What about feedback? Don’t worry, it has rumble, but I’m sure many of the joystick jockeys are already not liking the idea of not getting any physical feedback from the controller. Well, what Valve has implemented into the controller is Haptic technology. This is a form of non verbal communication technology that relays a message to the person holding the controller; and according to Valve, their Haptic technology can relay ingame information about speed, boudaries, thresholds, textures, action confirmations, and etc. Just like the PS4 controller, the center of the Steam Controller has a touch screen. The touch screen’s main purpose is to accommodate the large number of games on Steam that might require more buttons than what is already available on the controller. The entire screen itself is also clickable, and it also allows gamers to browse available commands, can be used for a radial dial, provide map information, and etc. There are 16 buttons total on the controller, and Valve says that half are accessible without having to remove your thumbs from the pads. They are all symmetrically placed, so it doesn’t matter whether or not your left or right handed. As I’ve stated earlier, not all Steam games are compatible with controllers, and programs like Xpadder convert controller inputs to mimic keyboard & mouse. 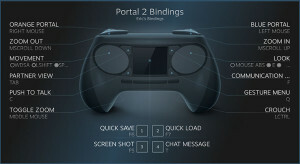 Valve also incorporates a similar program to enable all Steam games to be compatible with the Steam Controller. This is called Legacy mode. Valve provided an example, as seen to the right. 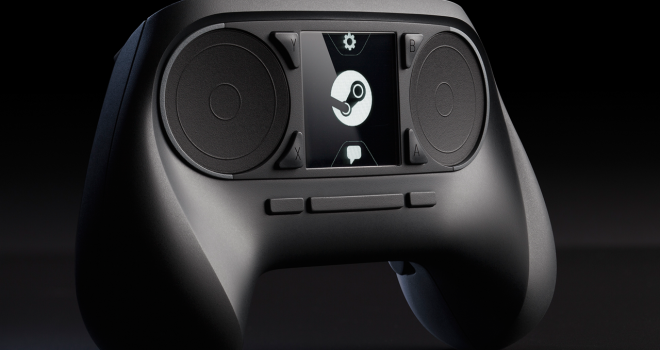 Valve also says that the controller is completely open for gamers to hack and customize. I’ve got to say that this controller is going to finally do something that has never been done before: offer the precision of keyboard and mouse, on a single controller. Part of the reason why they usually keep console & PC gamers separate from competitive online multiplier, is because the accuracy that can only be found on keyboard and mouse destroyed console gamers each time. Valve will finally bridge the two platforms and revolutionize the market! I’m sure many of you agree when I say, I cannot wait for the Steam Machine, Steam OS, and Steam Controller to hit the market! This looks great, but at the end of the day, I play games, not controllers. Good point, but do keep in mind that bad controls can ruin an experience. Not speaking about the Steam controller, since I haven’t gotten my hands on it yet, but the controller must be good. Examples of bad controllers: Coleicovision, Intellivision, Commodore 64 Joystick, N64(arguable; was ergonomic, but the layout was wonky), OG Xbox. Don’t know about this one BBC. I love Steam, but this controller doesn’t look that good to me. It could be like the Wii U controller (in which it feels a lot more comfortable than it looks), but as of now I’m not that impressed. This has to be the most fanboy article I’ve ever read. If MS or Sony announced this controller the internet would mocking them for weeks. If MS or Sony announced such a thing, they’d be mocked only because of the expectations set by what they’ve done in the past. PlayStation and Xbox have had analogues since the beginning! But what of the Steam Machine? It’s the first of its kind, no expectations have been formed by previous iterations because… well, there are none! Steam Machine is a new experiment that may very well be the most risky, yet interesting ventures Valve’s ever taken! It could go anywhere from here, and that’s the beauty of new things– you never know what to expect.